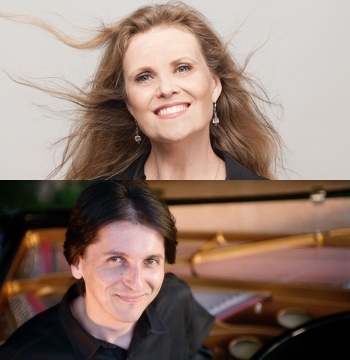 8-time Grammy Nominee Tierney Sutton teams up with pianist Tamir Hendelman for a special duo evening, following their recent tours to Japan and Italy. Sutton is heralded for her abilities as a jazz storyteller and her ability to use her voice as an instrument. Hendelman is known for his sense of swing, imaginative arranging, sensitive touch and his work with vocalists from Natalie Cole to Barbra Streisand. Together the duo will draw on sources from Bill Evans to Nancy Wilson, Chick Corea to Cy Coleman and more. 8-time Grammy-nominated jazz vocalist Tierney Sutton has received a “Best Jazz Vocal Album” Grammy nod for every project she has released in the last decade. Known for her impeccable voice and imaginative treatments of The Great American Songbook, Sutton is heralded for her abilities as both a jazz storyteller and her ability to use her voice as an instrument. Her 12 recordings as leader have addressed themes such as materialism (“Desire” 2009), the pursuit of happiness (“On The Other Side” 2007), as well as paying tribute to the music of Bill Evans (“Blue In Green” 2002), Frank Sinatra (“Dancing In The Dark” 2004), and pop icon Sting (“The Sting Variations” 2016). Her 2013 Joni Mitchell tribute, “After Blue” featured keyboardist Larry Goldings, drummer Peter Erskine, jazz vocal legend Al Jarreau, and NEA Jazz Master flautist Hubert Laws. In May 2016 Tierney was approached by legendary Director Clint Eastwood. The original score to his box-office smash, “Sully”, was created by Tierney Sutton Band pianist, Christian Jacob, The Tierney Sutton Band and Clint Eastwood. The end-title song “Flying Home” features music by Eastwood and lyrics by Tierney Sutton and JB Eckl. It is performed by Tierney Sutton and The Tierney Sutton Band. When she is not performing, Tierney is in demand as both a studio vocal producer and vocal educator. In 2016 she worked with famed lyric soprano Natalie Dessay for Sony Classics’ “Pictures of America” and the soon to be released “Between Yesterday and Tomorrow”. Tamir Hendelman is an acclaimed pianist, composer, arranger and educator. Leader of the Tamir Hendelman Trio (whose recordings reached the top of the US jazz charts), he is a long time member of the Clayton-Hamilton Jazz Orchestra and the Jeff Hamilton Trio. He has recorded with Barbra Streisand on “Love Is The Answer” (2009) and “One Night Only: An evening at the Village Vanguard” and joined her orchestra tour of North America with her in 2012. Tamir Hendelman has performed with Benny Golson, Scott Hamilton, Richard Galliano and Graham Dechter and arranged and recorded for vocalists Natalie Cole, Roberta Gambarini, Polly Gibbons, Jackie Ryan and many more. He has performed Rhapsody in Blue with the Winston Salem and Arizona Musicfest Orchestras and will do so in 2020 with the Memphis Symphony. Since 2005 he has been on the faculty of the University of California, Los Angeles teaching jazz improvisation, piano, harmony and composition. He has conducted workshops in universities and schools in Asia, Europe and the US.